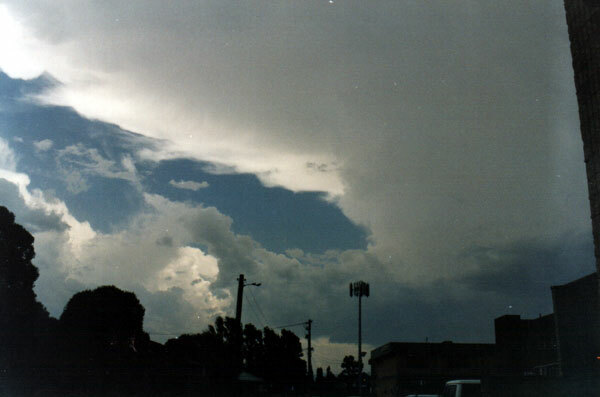 20th January 1998 - South West outskirts of Sydney. A rather frustrating summer in the Illawarra with several days where storms developed north of the area, but leaving the Illawarra untouched. 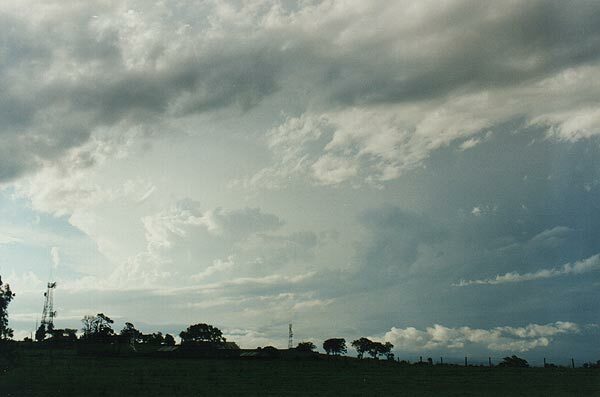 Early afternoon on the 20th January saw some very promising looking thunderstorms develop around the Illawarra. The first photo is a view from the back door at work at around 3pm. ( I must at this stage apologise for the quality of the photos, I am a little worried that the film could have been affected by heat and humidity as every shot looks a little washed out ). 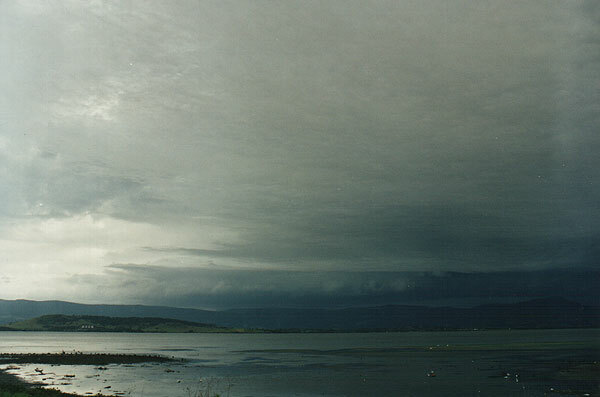 Surprising this promising looking storm did not amount to much and passed quickly. By 5pm when I finished work, activity in the southern Illawarra had quietened. On my bicycle ride home I noticed a large multicell structure to the north. 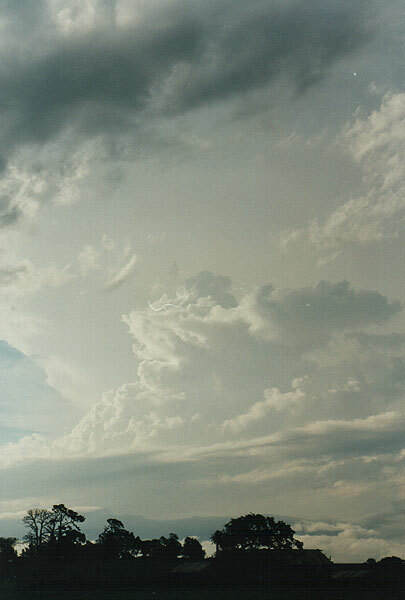 As I watched a gust front slowly came into view from over the escarpment. This gust front was moving in a definite SE direction, whilst the actual storms was drifting NE. I have always like gust fronts that move away at angles from the downdraft, rather than straight out ahead of the storm. I may be wrong, but tend to find that these storms more potentially severe. I targeted the Picton area for a chase. My aim was to get to the NW side of the storm. I ran into very heavy rain at Mt Keira, almost to flash flooding stage, the rain cleared rather suddenly at the top of the Mt Keira pass and I could see the best action was still towards north west, the storm was moving very quickly. At Mt Razorback near Picton about 6.30pm I decided to still move NW, to try to avoid the obvious heavy rain to the N and NE, not to mention urban areas of Sydney's south west suburbs which would be a mistake. Unfortunately this system moved rather quicker than I anticipated and I was never able to catch it, let alone get to the rear or north west side of the storm. I noticed some small limbs down at Luddenham, and the emergency crew, which I later found out was because a house had lost its roof. I gave up the chase north of Luddenham at Elizabeth drive and headed to Liverpool. There was another narrow damage path along Elizabeth drive, tree branches down. The photos below show the storm to the north and north west at around 7.45pm, it was less than 30 minutes off sunset and I had no hope catching the system before dark. Although lots a low cloud made for poor photos you can clearly see the slope of the large rear anvil and updraft.